Deep in the remote reaches of tropical paradise, raucous bird calls and the lively chatter of monkeys fill the balmy, humid air. High in the lush, sun-soaked canopies heavily entwined with foliage and thick vines, life is continuously stirring. All the way down to the dappled, cool forest floor where the continuous whirr of flitting insects and chirping frogs can be heard. 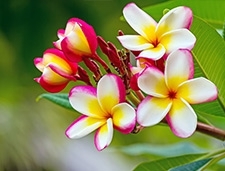 Amidst all of this bustle is the familiar hum of the ever-diligent honeybee foraging the sweet nectar of a spectacular myriad of tropical flowers and tree blossoms such as exquisite orchids and delicate plumeria. The bold, sweet flavor of this Raw Organic Tropical Blossom Honey comes from remote tropical forests around the world. Teeming with diverse flora and vegetation, tropical forests make up one of Earth's largest biomes (major life zones). We comb the globe to find these sites that meet the strict standards for organic certification of honey. This 100% pure, organic honey is not only regionally sourced, but is also sustainable and supports SAVE the BEE®. We're proud to bring you a raw honey that meets European standards for bee pollen content. Because of the unique way our honey is handled, it retains the bee pollen, enzymes, and other micronutrients generally lost during processing. Our raw honey is never heated over 115 degrees F and is only strained, never filtered. Certified kosher and gluten-free, GloryBee's Raw Organic Tropical Blossom Honey is honey you can feel good about eating and sharing with your friends and family.